What sparked Blaise Pascal’s interest in mathematics? One possibility is that when Pascal’s father tried to put off teaching it to his son, it didn’t go as planned. Instead, the delay piqued Pascal’s interest and he wound up teaching himself mathematics, developing an early fascination with the subject. Today, Blaise Pascal is known for his work in mathematics as well as in other areas, such as philosophy and theology. Blaise Pascal was born on June 19, 1623, in central France. As a child, Pascal was often unwell, and this sickly nature would stay with him throughout his life. Pascal’s father, Étienne Pascal (a member of the Noblesse de robe), moved to Paris with his children in the early 1630s. There, Étienne focused on furthering the education of his children. He believed that if he exposed his son to mathematics, Pascal would become so enthralled that he wouldn’t be able to focus on other subjects. To attempt to give Pascal a balanced education, Étienne held off on his son’s study of mathematics. Unsurprisingly, this seemed to have the opposite effect on the young Pascal, who simply began to teach himself about math. On his own, Pascal apparently found that a triangle’s interior angles add up to the sum of two right angles. Since trying to delay Pascal’s mathematics education was obviously not working, Étienne eventually gave in and started teaching his son the subject. Blaise Pascal. Image in the public domain in the United States, via Wikimedia Commons. Impressed with Pascal’s skills, his father introduced him to an academic circle in Paris called the Académie libre when Pascal was around 13 years old. This was the start of his involvement in the academic community. Throughout his life, Pascal would pursue both academic and religious knowledge, producing important works in both areas. While Pascal was a master of the written word and is known for his Lettres Provinciales and the Pensées, we focus on his various academic works here. When Pascal was 16 and involved in the Académie libre, he presented a one-page essay called the “Mystic Hexagram”. The paper stated that if a hexagon is inscribed within a circle or conic, then the intersection points of three opposite sides will reside on a line (now known as the Pascal line). This work contributed to the field of projective geometry and is known today as Pascal’s theorem. Pascal’s theorem. 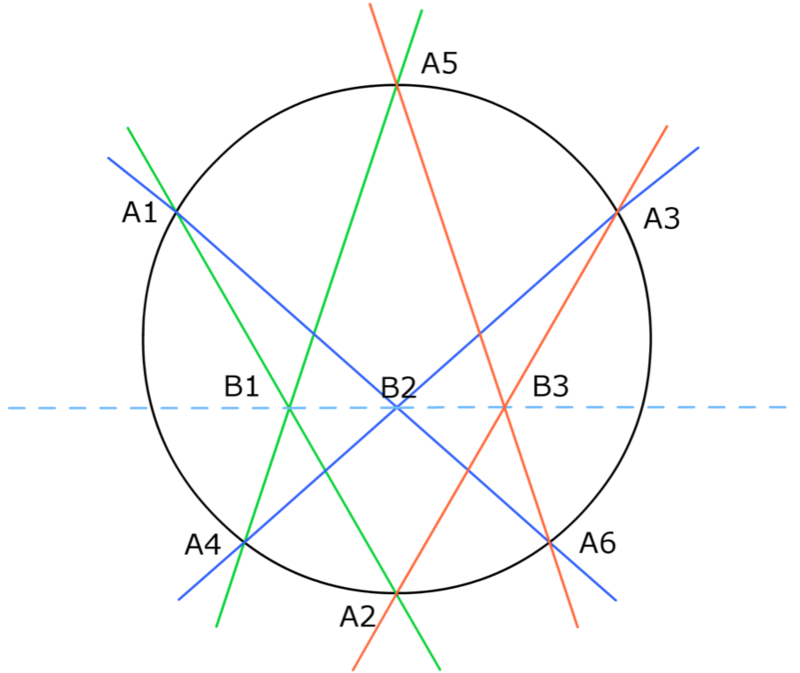 In this example, the intersection points B1, B2, and B3 are collinear. Image in the public domain, via Wikimedia Commons. Another goal of Pascal’s was to make mathematical calculations quicker and easier. The idea began when Pascal observed his father working on taxes. This caused Pascal to wonder: Could he invent a device to simplify this process? Eventually, Pascal designed the Pascaline. 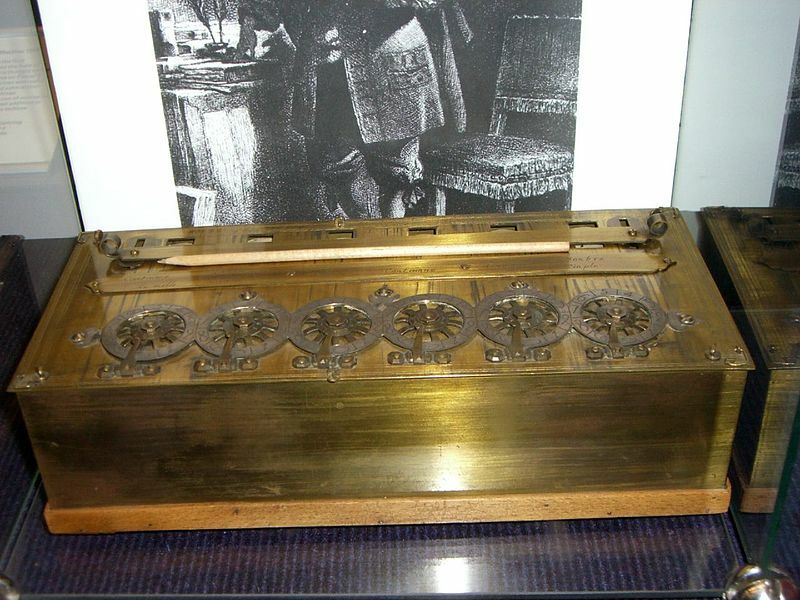 This early calculator was capable of performing additions and subtractions via movable dials or gears. Pascal would continue to work on this device in the years after he created it. A Pascaline. Image by Mirko Tobias Schaefer — Own work. Licensed under CC BY-SA 2.0, via Wikimedia Commons. How many times do you have to throw a pair of dice before you can expect to get two sixes? If a wager game of dice isn’t completed, how can you divide the stakes? 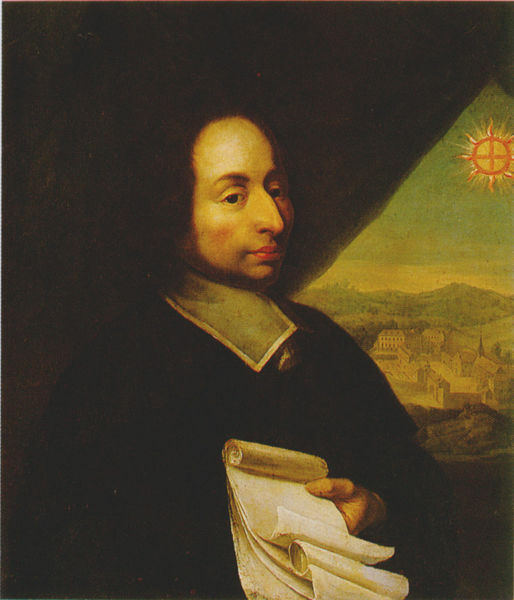 Intrigued, Pascal set about solving these problems and discussed his answers with the mathematician Pierre de Fermat. Pascal and Fermat’s exploration of the topic enabled them to develop the basis of the modern theory of probability. Related to this is Pascal’s paper Treatise on the Arithmetical Triangle, which discusses what is known today as “Pascal’s triangle”, a tool that can be used to solve such probability problems. While Pascal was far from the first to discover this triangle, he helped further our knowledge of it. Interestingly, dice were not the only modern gambling-related tool Pascal was involved in. While trying to invent a perpetual motion machine, Pascal also created an early version of a roulette wheel. Besides mathematics, Pascal was also interested in a variety of other subjects. For example, he was inspired by work from Evangelista Torricelli to investigate pressure and the existence of vacuums. Pascal ran experiments using mercury barometers to investigate atmospheric pressure. Using some of the findings from this work, Pascal wrote New Experiments Concerning the Vacuum, which suggested that a vacuum existed in the barometer tube. In addition, Pascal’s hydraulics and hydrodynamics work led to him developing a syringe and hydraulic press. Today, you can find mentions of Pascal in many different places. Just a few of his namesakes are the standard unit of pressure, the pascal (Pa); Pascal’s principle or law; and the Pascal programming language developed by Niklaus Wirth in the 1970s.